Dr. Z Reflects: Happy International Dot Day and National Online Learning Day!! Happy International Dot Day and National Online Learning Day!! Just wanted to wish you a happy International Dot Day. This is based upon Peter Reynolds' book, "The Dot" It is a short picture book that celebrates creativity and helping develop the creative mindset. Here is a 4-min read aloud of the book. You will LOVE it! I first found this book a few years ago at the ITEC conference in Des Moines. They had Peter Reynolds as a guest speaker. Peter spoke about The Dot book in his presentation and I immediately fell in love with the book. I stood in line for an hour to get him to autograph a couple of copies so that I could give them to our grandsons. My favorite part of this story began while he was drawing a picture related to the book in the front cover. I asked him, "When you draw, do you have the picture in your mind and then work to represent it on the paper?" He thought about it for a minute and replied "No, I see the picture on the paper and then I just need to connect the dots." Fascinating! 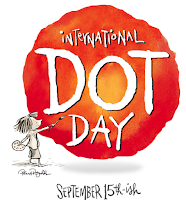 International Dot Day was originated in 2009 by Terry Shay, music teacher at North Tama High School. Last year, I had a student in my Ed Tech and Design class who had Terry Shay as a teacher. He said that Mr. Shay was an amazing teacher. Just found another video created by the author, Peter H. Reynolds, that explains how he creates wonderful graphics . . . all beginning with a dot. This is also National Online Learning Day. This day "showcases how students of all ages are thriving with the ability to learn online—anywhere, anytime."